I read. I read a lot. I read a lot of different types of books. I read science and science fiction. I read poetry and story. I read theology and historical fiction. Last year I read The Hidden Life of Trees, The Hawk and the Dove series about a 14th-century Benedictine monastery, and Elizabeth Johnson’s Creation and the Cross, among many other titles. When I learned to read, I realized there was a bigger world than just my own little corner. What I could see, what I knew, was only a small piece of reality. Reading was the ticket to travel around the globe, to historical events, to faraway places, to possible futures. In our little country library, students were only allowed to take out four books at a time. My dear librarian, Mrs. Brenner, let me take out six. I knew I was lucky. I knew I was blessed. As I matured, I realized that prayerful quiet reading showed me my own heart, and revealed the hearts and minds of others to me. Spiritual reading opened up the world of great thinkers and holy writers for me. To hear the child’s voice calling to St. Augustine to take up the Book and read, to walk and sweep the cloistered halls with Therese of Lisieux, to preach to almond trees and wolves with Francis of Assisi, to climb the Seven Story Mountain with Thomas Merton — these are my memories of the power of books. And the stepping stones in my early spiritual journey. So, I especially love reading widely in the area of spirituality. Now is a time of flowering in the spiritual publishing world. Not only is there an interest in this area, but many authors also share their journeys with us. And my favorite books are the ones that don’t just talk about spirituality. I love the ones that help form my own relationship with the Divine. I love to plumb the depths and climb to the mountaintops. I love to think new thoughts and rest in God’s beauty. I want to ponder the possibilities and rejoice in prayer and stillness and find hope and love. Like clay in the potter’s hands, I want to be formed into a vessel that has purpose and design. Reading wise books helps us uncover wisdom. Sharing our insights can enliven our spirits and give us joy and comfort. Hope and help buoy us up when life is difficult. We are not on this journey alone. Books can be life preservers. Companions for the journey. Books line my office walls and remind me of where I have been and what has inspired me. Books give me new ideas for classes and preaching. Books have always been my friends. I read. I read a lot. I am grateful for all those, in print and in person, who have journeyed with me. 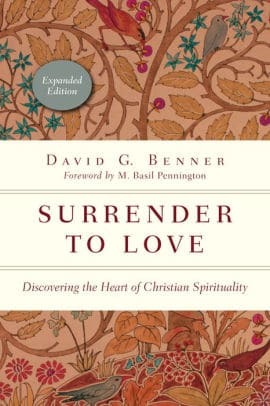 Surrender to Love is available in Dominican Center's Bookstore. Diane Zerfas, OP, is a Dominican Sister and the Center for Spirituality Coordinator at Dominican Center at Marywood. She is a spiritual director, retreat speaker, and a life-long reader and pray-er.